As an old expression goes, there are two certainties in life: death, and taxes. Yet, even though both these things will almost certainly happen in our lives, we still have some control over trying to avoid death, just as we have some control over managing the taxes we pay over time. Nevertheless, both will happen. When it comes to taxes, they often happen even though we don’t notice. We pay taxes on the gas we buy at the pumps, often without noticing it. Similarly, both the buying and selling of a home comes with various different taxes we sometimes only learn about after the fact. Yet, learning about these taxes before a real-estate transaction occurs, whether it’s buying or selling, can help reduce one’s overall financial burden. With respect to the buying of a home, there are various taxes that purchasers should know about. There is a land-transfer tax that has to be paid by home buyers in the province of Ontario. In some municipal jurisdictions, such as Toronto, another land-transfer tax has to be paid by the home buyer on top of the one paid at the provincial level. 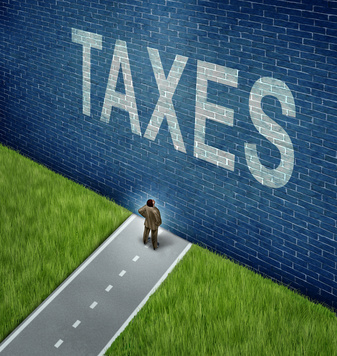 As already mentioned, taxes sometimes seem like they’re everywhere. In addition, provincial sales taxes need to be paid on new homes, too. In Ontario, it’s the harmonized sales tax (HST), which replaced the previous goods and services tax (GST) in the province and the provincial sales tax (PST), too. HST also needs to be paid on any real-estate lawyer’s fees accumulated during the real-estate closing process, as well as any expenses and disbursements paid out during the performance of their legal duties. Various taxes come with the selling of a home, too. For example, commissions earned by real-estate agents come with an HST charge. In addition, any selling of an asset has capital-gains taxes implications as well. If the home is sold for more than the owner’s original purchase prices, the appropriate capital-gains taxes then apply.